February 17, 2011 - U.S. Transportation Secretary Ray LaHood on Wednesday made the following statement regarding Florida Governor Rick Scott’s decision to decline high-speed rail dollars ($2.4 Billions). U.S. Transportation Secretary Ray LaHood: “We are extremely disappointed by Governor Rick Scott’s decision to walk away from the job creating and economic development benefits of high speed rail in Florida. “We worked with the governor to make sure we eliminated all financial risk for the state, instead requiring private businesses competing for the project to assume cost overruns and operating expenses. “It is projects like these that will help America out-build our global competitors and lay the foundation needed to win the future. This project could have supported thousands of good-paying jobs for Floridians and helped grow Florida businesses, all while alleviating congestion on Florida’s highways. The Governors office was called for a comment. However their response was “see our press release.” When questioned on specifics the office staff stated “wait a minute” she then began reading the press release. When questioned again for specifics, the office staff hung the phone up. Richard Lynn "Rick" Scott (born December 1, 1952) is a politician who is the 45th and current Governor of the U.S. state of Florida. Scott served in the U.S. Navy and then went into business. He earned a business degree and law degree and joined a Dallas firm where he became partner. In 1987 he helped found the Columbia Hospital Corporation with two business partners; this merged with Hospital Corporation of America in 1989 to form Columbia/HCA and eventually became the largest private for-profit health care company in the U.S. He was forced to resign as Chief Executive of Columbia/HCA in 1997 amid a scandal over the company's business and Medicare billing practices. The federal government fined Columbia/HCA $1.7 Billion for Medicare and Medicaid fraud that took place under Rick Scott's watch as CEO. That sum, which ultimately led to Scott's ouster, set a record for the largest fine of its kind in history. Scott later became a venture capitalist, and entered into politics in 2010 (on the campaign trail there were allegations of insider trading by Scott), when he announced his intention to run for Governor of Florida. It was reported last July, Scott spent $5 million of his own money to start Conservatives for Patients' Rights, an organization aimed at defeating Democrats' health care reform legislation. Ads put out by Scott's group warned viewers that the new healthcare legislation "could put a bureaucrat in charge of your medical decisions, not you." 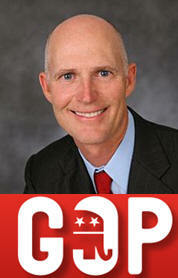 Governor Scott states in his press release he wants to grow Florida’s economy and create jobs. However, there are no signs of that. Scott has recently proposed a 10 percent cut in school funding ($703 million) State Senator Sobel told The Miami Herald that she feared that would have long-term negative impact on job growth, noting that a strong educational system helps attract businesses. "If you're cutting money at that level, you're not going to attract the kind of businesses that we want to have." Scott has proposed eliminating 1,690 jobs from the Department of Corrections ($82 million) when crime has reached an all time high for the state of Florida. Scott has announced he will reduce the states work force by 8,700 workers. The Miami Herald notes that despite these drastic reductions, Scott has budgeted for increased personnel and salaries in his own executive office. Scott has also sought a federal waiver to transfer Florida's Medicaid recipients into privately run managed-care programs. Much of the Florida business community wants an end to the Cuban Embargo, but not the pro-business Governor. Wednesday, he went on record saying the embargo should continue. One reader referred him to Sarah Palin a one term governor. With Tuesday’s tea party governance thinking, the one term Florida Governor Rick Scott to turn down $2.4 federal funding for the development of high-speed passenger rail, U.S. Senator Kirsten Gillibrand immediately wrote to U.S. Transportation Secretary Ray LaHood urging him to redirect the funding towards high-speed rail projects for New York and the Northeast Corridors. “There are known knowns; there are things we know we know. We also know there are known unknowns; that is to say we know there are some things we do not know. But there are also unknown unknowns – the ones we don't know we don't know.” Maybe the governor will amend his press release into something that is more coherent. As you know, I was elected to get Floridians back to work and to change the way government does business in our state. I am committed to making good on those promises. “Recently, I sent a budget proposal to the legislature that reduces the size and scope of government; reduces the costs of that government and passes those cost savings on to taxpayers so that we can create new jobs and turn Florida’s economy around. “I believe when you reduce government’s reach and hold that government accountable, you create an environment where the economy can flourish. When you reduce taxes and put that money back in the hands of hardworking Floridians and Florida businesses, that money will be spent on creating private sector jobs. “As you know, my background is in business, not politics. But you don’t have to be an economics expert to understand that if you spend more money than you take in, your business will fail. Unfortunately, politicians haven’t always seemed to grasp that same principle. “In fact, the Obama administration just announced a $3.73 trillion budget that includes the largest budget deficit in our nation’s history ($1.65 trillion). The president’s budget includes $1.6 trillion in higher taxes. Those higher taxes will impact Floridians and our competitiveness worldwide. We cannot expect individuals to build businesses in America if our taxes are higher than other countries. “Higher taxes and more government spending is a recipe for disaster. Government has become addicted to spending beyond its means and we cannot continue this flawed policy. “Let us never forget, whether it is Washington or Tallahassee, government has no resources of its own. Government can only give to us what it has previously taken from us. That is why today I am announcing my decision to reject the Obama administration’s plan to partially-fund the costly Tampa to Orlando high-speed rail project. Capital cost overruns from the project could put Florida taxpayers on the hook for an additional $3 billion. Ridership and revenue projections are historically overly-optimistic and would likely result in ongoing subsidies that state taxpayers would have to incur. (from $300 million – $575 million over 10 years) – Note: The state subsidizes Tri-Rail $34.6 million a year while passenger revenues covers only $10.4 million of the $64 million annual operating budget. “If the project becomes too costly for taxpayers and is shut down, the state would have to return the $2.4 billion in federal funds to D.C. The truth is that this project would be far too costly to taxpayers and I believe the risk far outweighs the benefits. “It is projected that 3.07 million people will use the train annually. Keep in mind that Amtrak’s Acela train in Washington, D.C., Boston, Philadelphia, New York and Baltimore only had 3.2 million riders in 2010. And that market’s population is 8 times the size of the Tampa/Orlando market. “President Obama’s high-speed rail program is not the answer to Florida’s economic recovery. We must make investments in areas where we will get a return for the shareholders – Florida’s taxpayers. “Rather than investing in a high-risk rail project, we should be focusing on improving our ports, rail and highway infrastructure to be in a position to attract the increased shipping that will result when the Panama Canal is expanded when the free trade agreements with Colombia and Panama are ratified and with the expansion of the economies of Central and South America. “By capturing a larger share of containerized imports entering our seaports, expanding export markets for Florida businesses and emerging as a global hub for trade and investment we can create up to an additional 143,000 jobs according to a recent chamber of commerce study. “It is absolutely critical that we make smart investments with taxpayer dollars, whether state or federal, and I believe our state will be better served by spending these funds on projects that will benefit Florida and not turn into a spending boondoggle. “The answer is to reduce government spending, cut government’s leash on our state’s job creators and then hold that government accountable for the investments it makes. That is what I was elected to do and that is how I plan to govern. Let’s get to work!